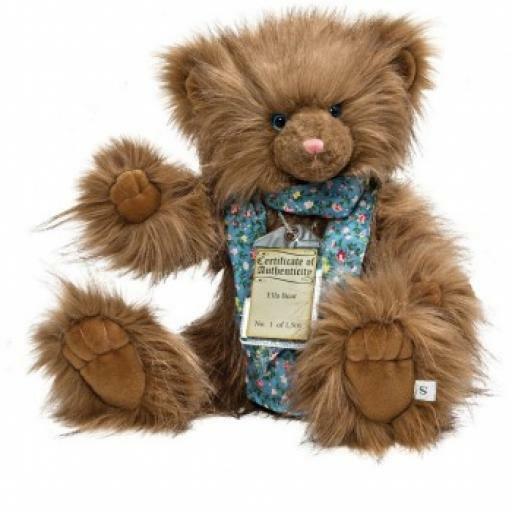 Friendly Ella is a lovely collectible bear. She's made with light mocha brown plush, with matching velvet ears and pads. Her toes, fingers and her sweet little nose are picked out in pink embroidery. She has beautiful blue eyes, a long shaved muzzle, and wears a blue cotton scarf patterned with petite flowers and foliage. As with all the Silver Tag bears, Ella is fully jointed, substantially weighted, and has a classic hump. Ella comes with an individually numbered Certificate of Authenticity. She is 54 cm standing. Ella is one of 1500. She can be spot cleaned.